The 17 Minute Produce Bag Tutorial! Go Green or Go Home! 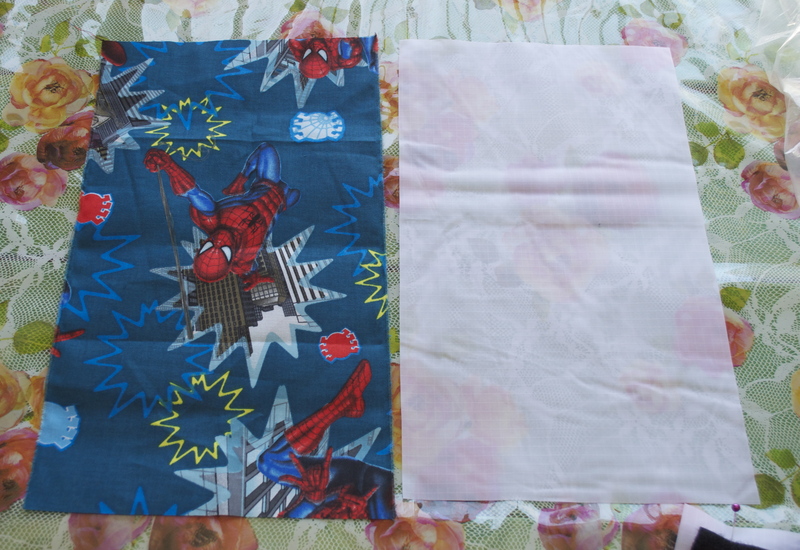 You are going to start by cutting your fabric- the bags that I made were used with 18″x22″ fabric. You can make your bag any size you want- smaller or bigger. 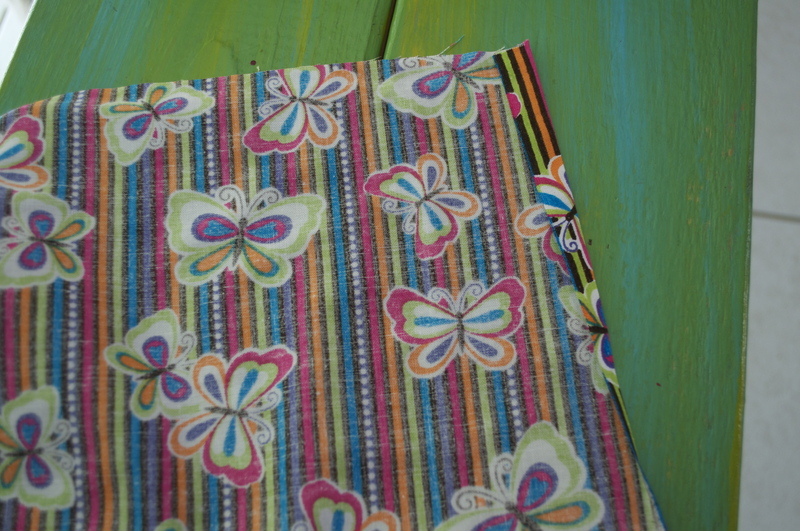 Take the LONGER side of your fabric and press the two sides over about 1/4″ inch and only about 2″ long. 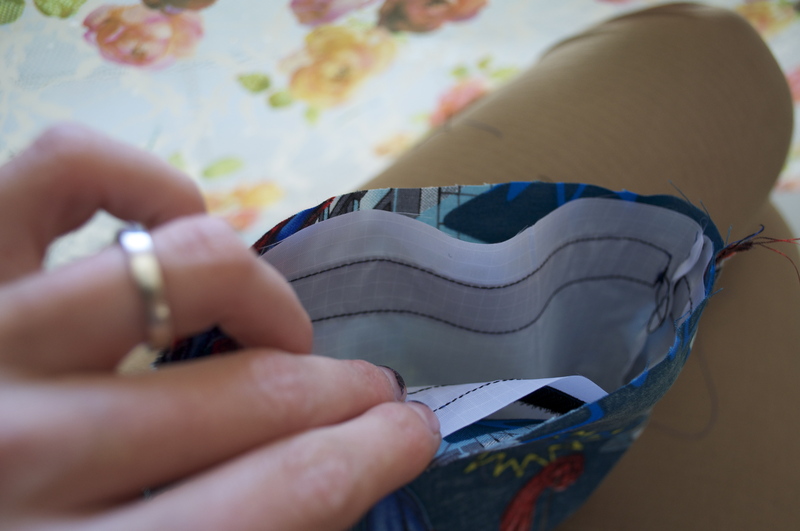 Then sew that 2″ crease in the middle- from top of bag to the end of the 2 inch crease. 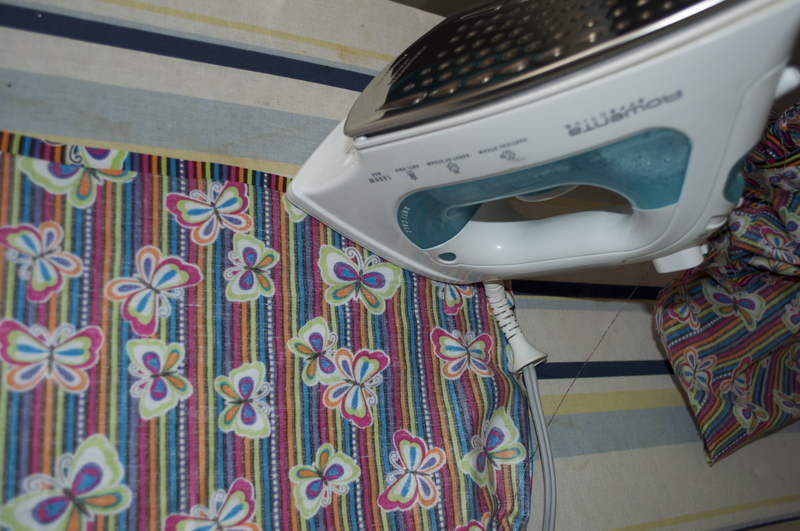 Next, press the top of the LONG side over about 1/4″, then press again on the same LONG side over about 3/4″. 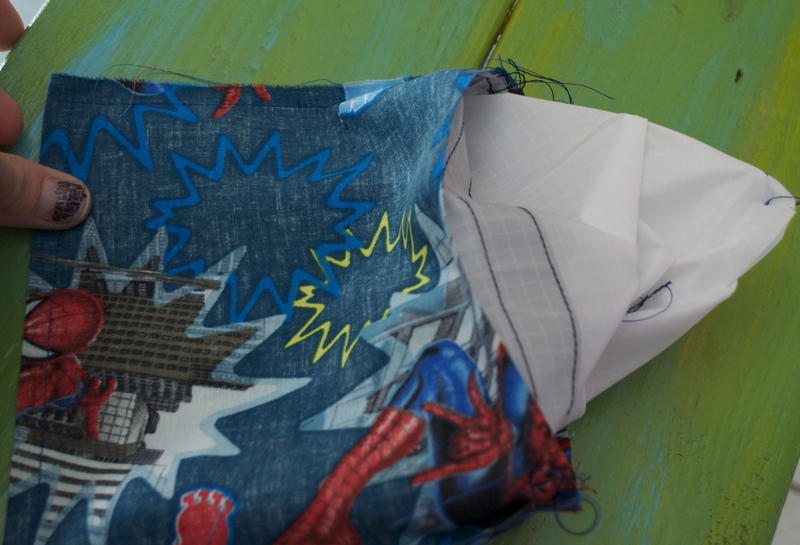 It can be smaller or bigger, depending on what you are going to use for your drawstring. What you are doing here will be what you put your drawstring through- to make it big enough to get the string in easy. 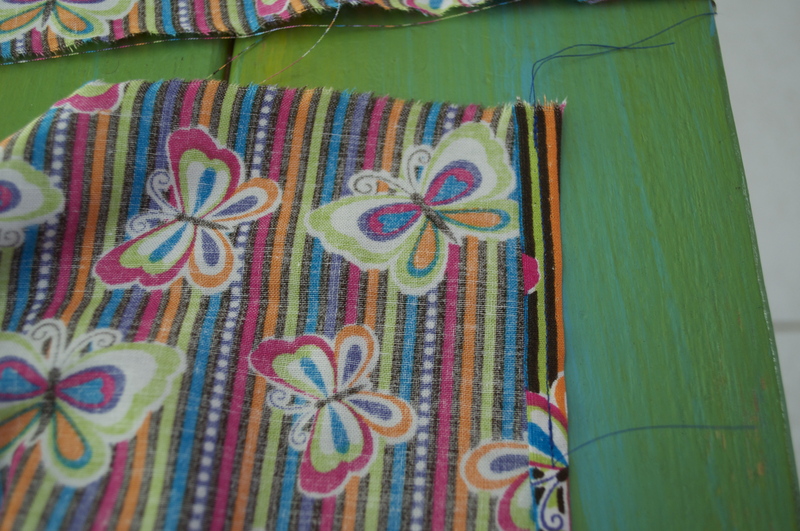 Then sew from the bottom of that 3/4″press from side to side. 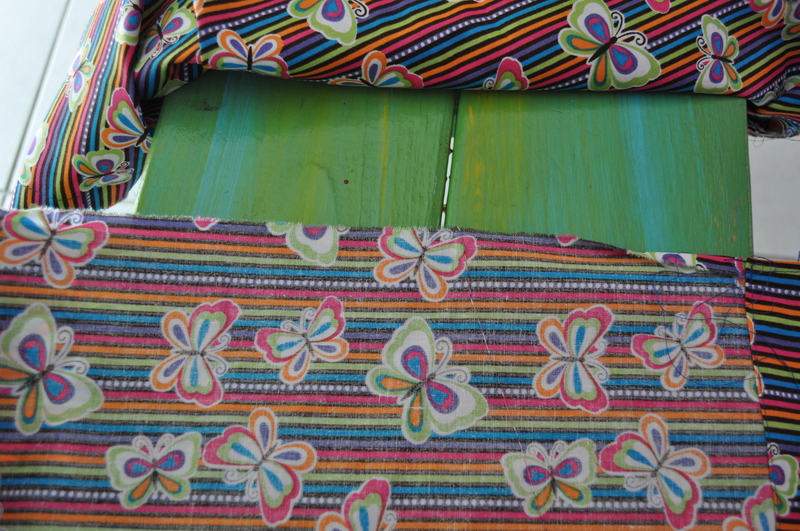 Then take the two sides and put them together- right sides together. 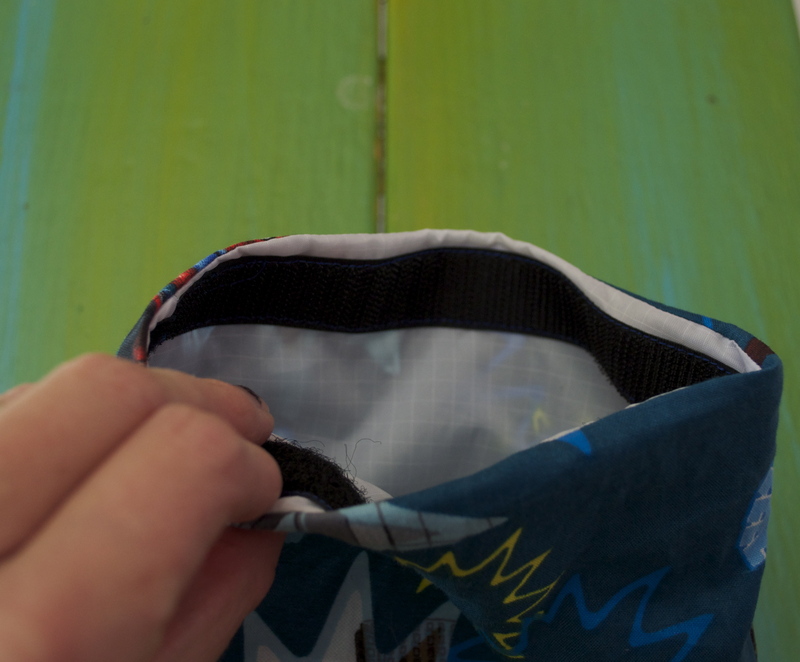 Sew from the bottom of your drawstring opening to the bottom of the bag. 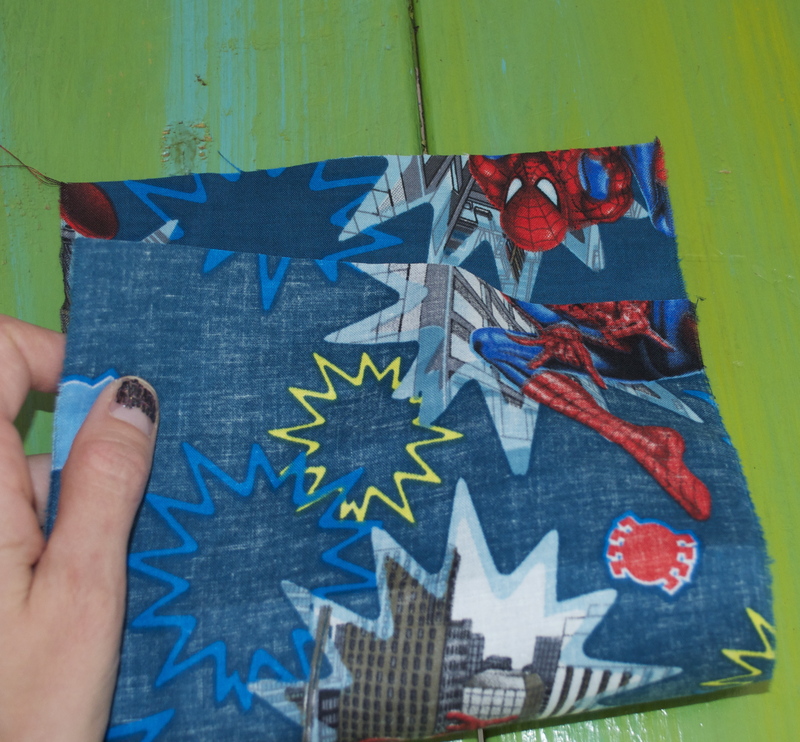 I made the seam about 1/2″. 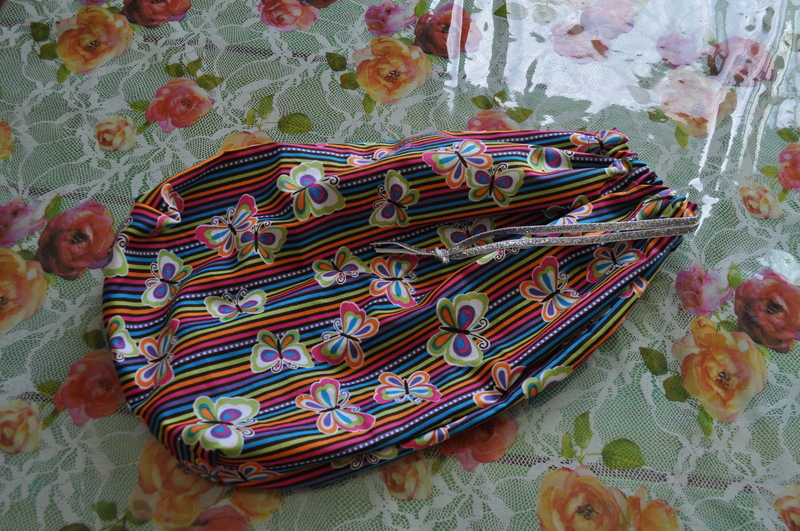 You do not want to sew closed the opening for the drawstring. 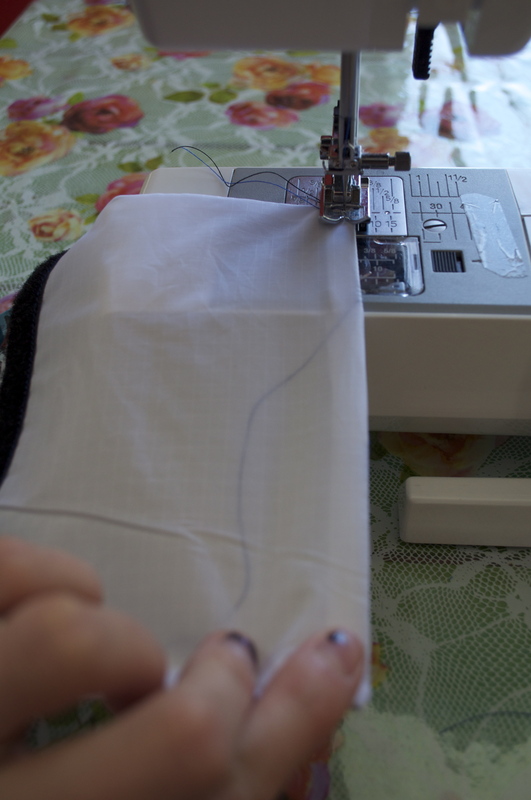 Backstitch the beginning and the end to secure your stitch. 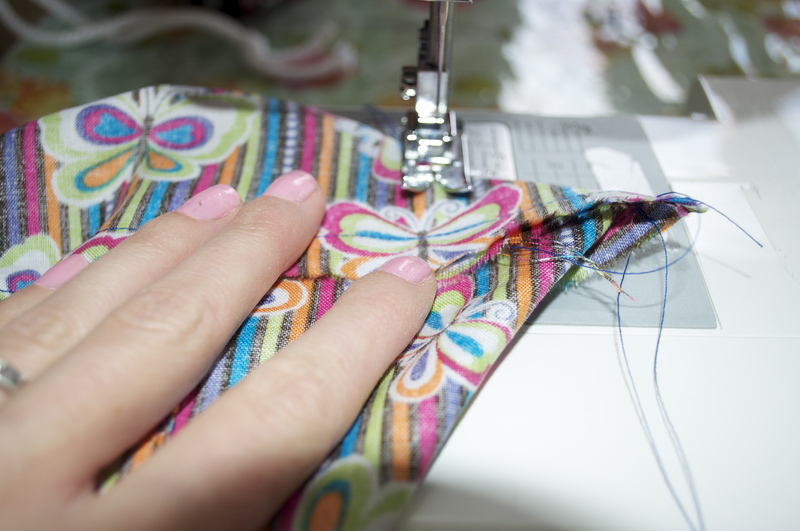 If you want to prevent fraying, zig zag stitch after you have sewn your straight stitch. 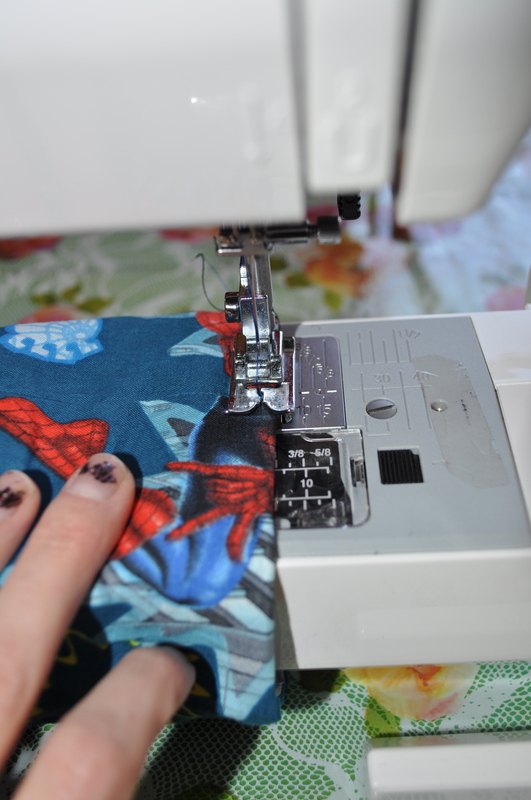 Or use your serger- I don’t have a serger. 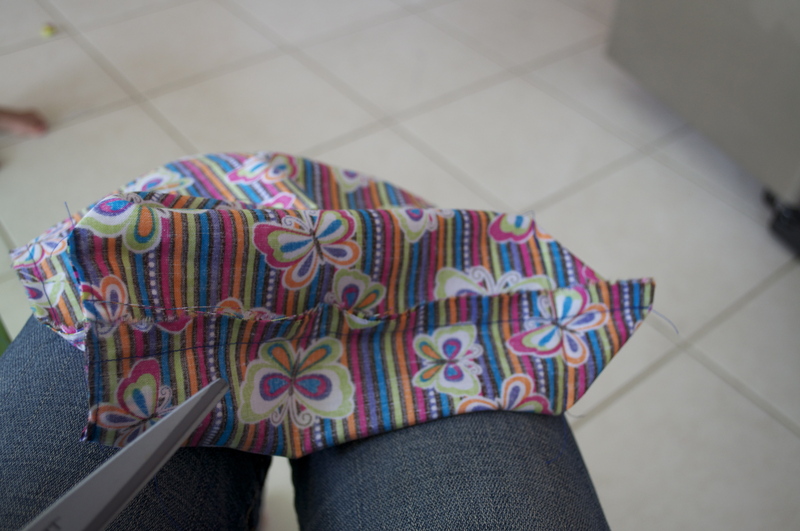 Next, sew the bottom of the bag. The same way you did the side. 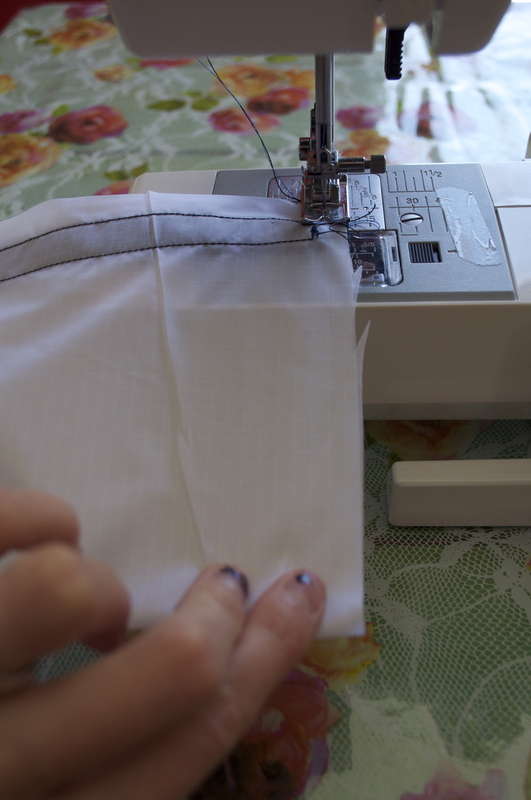 Sew it at 1/2″ seam. Square off the bottom of the bag- you can measure it or you can eyeball it. 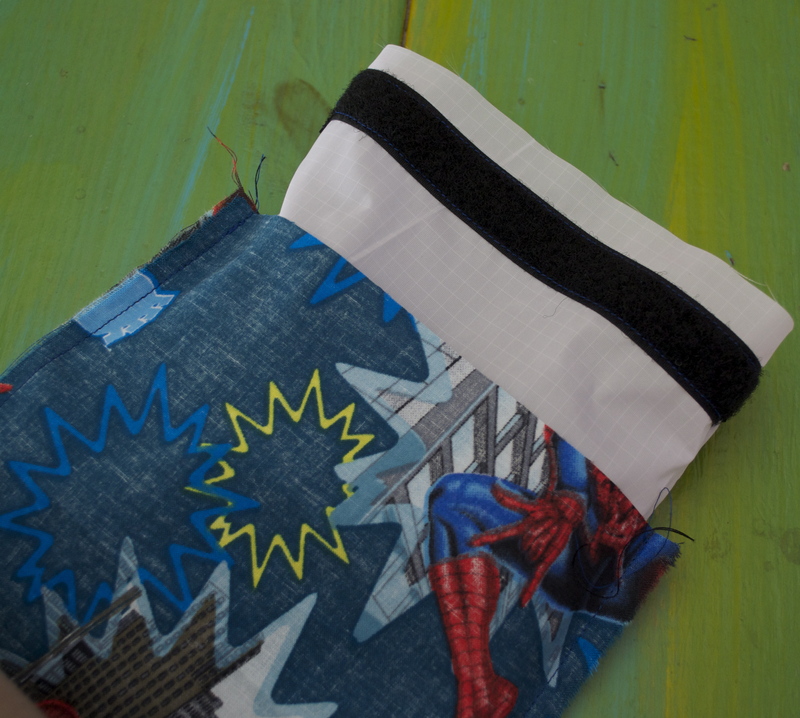 I made mine the seam about 1 1/2″ from the point of the bag to the seam. Do the same to the other side. 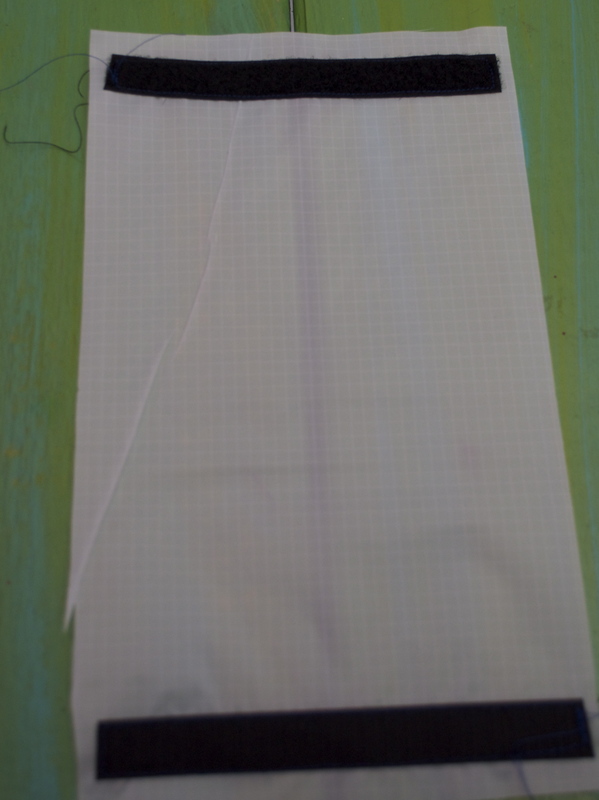 Then cut off your end pieces- this is going to make your bag have a rectangular bottom to it. 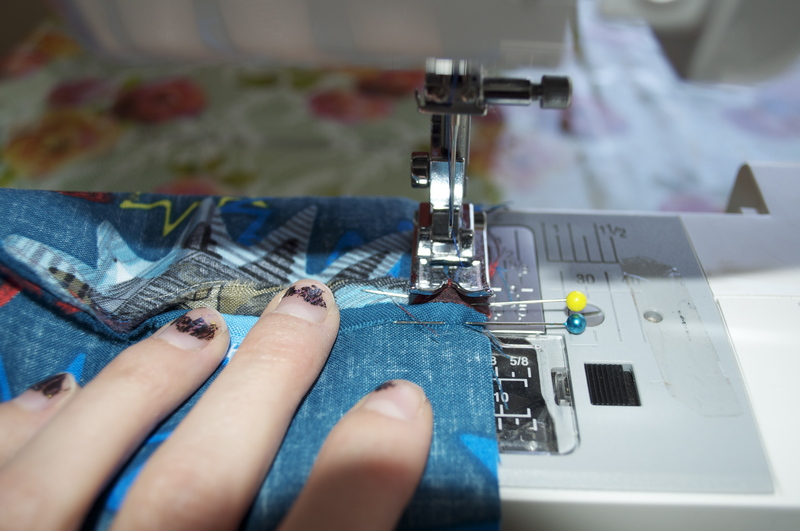 Next, to really get the top of the bag secure for the drawstring- use your sewing machine and go over the bottom of the opening a few times- forward and backward to really make it a strong connection. 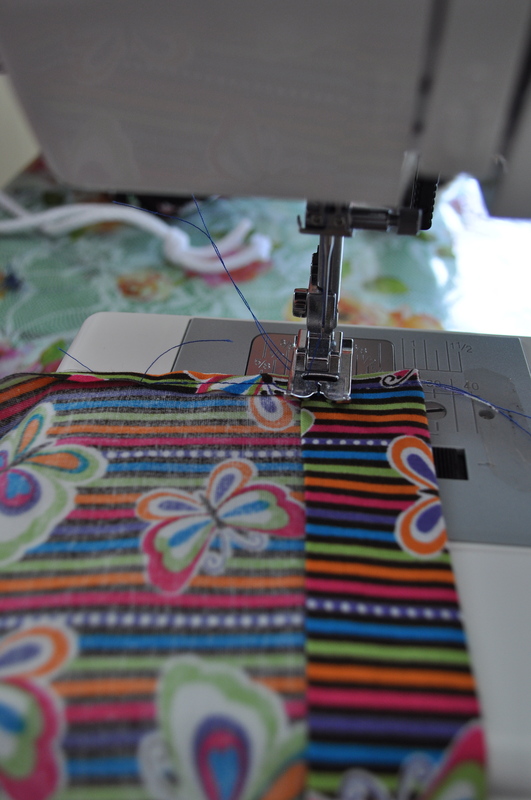 Whatever you are using for your drawstring- put a large safety pin on your string and use that to go through your bag! Tie the ends together in a knot- and VOILA! You are done!! Thanks to my lovely sister for telling me to make her these awesome bags!! Otherwise, I would have never made these Go Green or Go Home tutorials!! 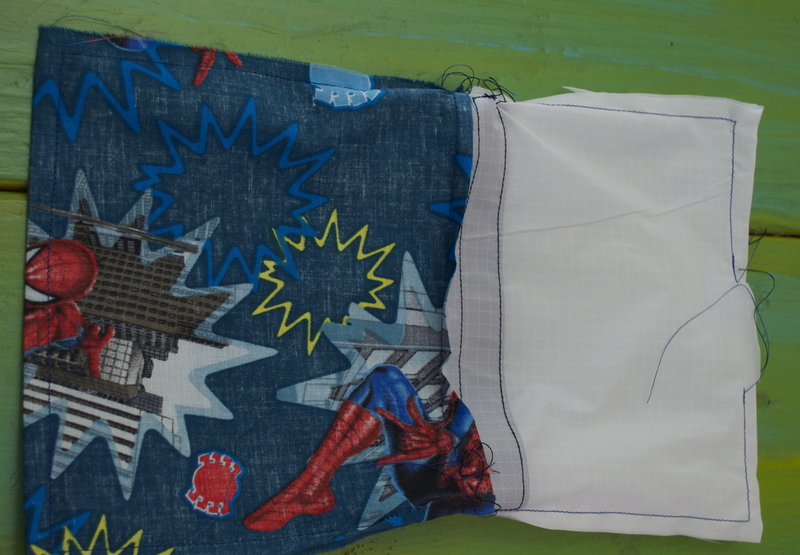 Posted in DIY, green, sewing, tutorial and tagged cotton, cute, DIY, easy, fun, green, reusable, sandwich bags, sewing, snack bags, tutorial. Bookmark the permalink. 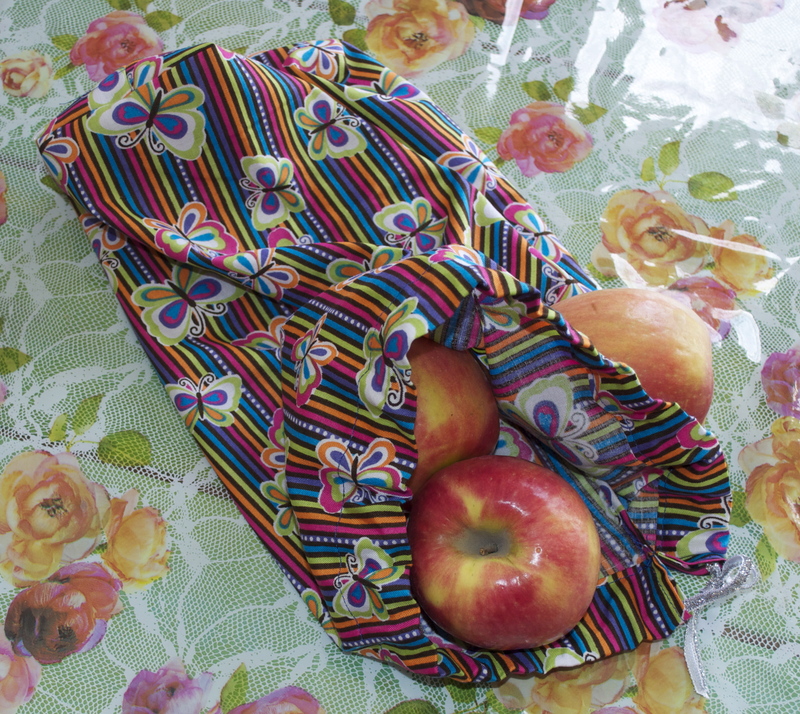 So today, I am going to be showing you how to make the reusable snack baggies. My sister wanted me to me some for her son, my nephew. He is in 2nd grade and they will come in very handy during his days at school- that is if he brings them home instead of “accidentally” throwing them away! 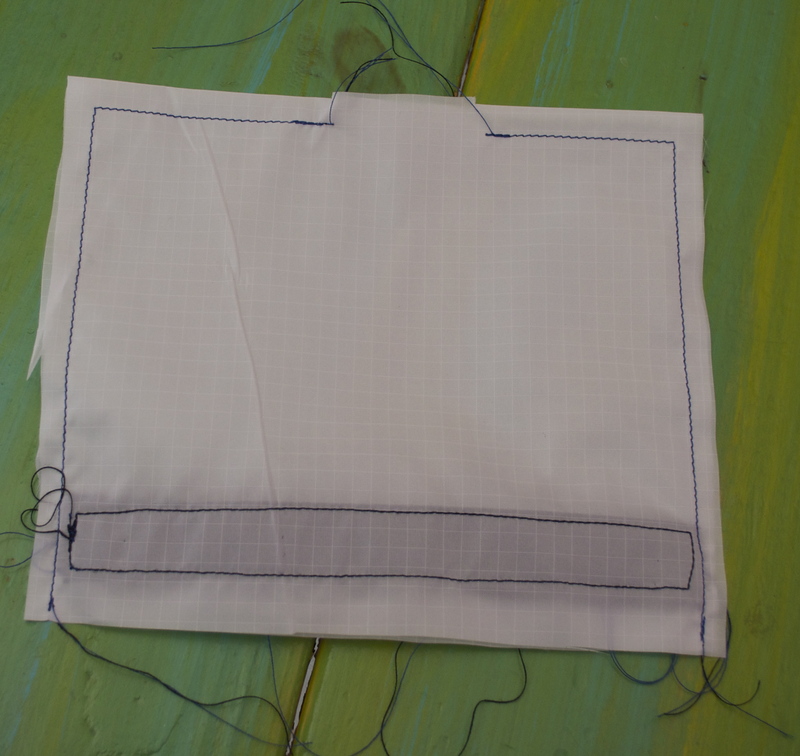 Start out with cutting your material- I cut mine in rectangles and then made little slits on the bottom of the nylon rip stop lining- if you don’t want to make the slits, cut your lining in half after you make your rectangles- cut in half the wide way, not the long way. 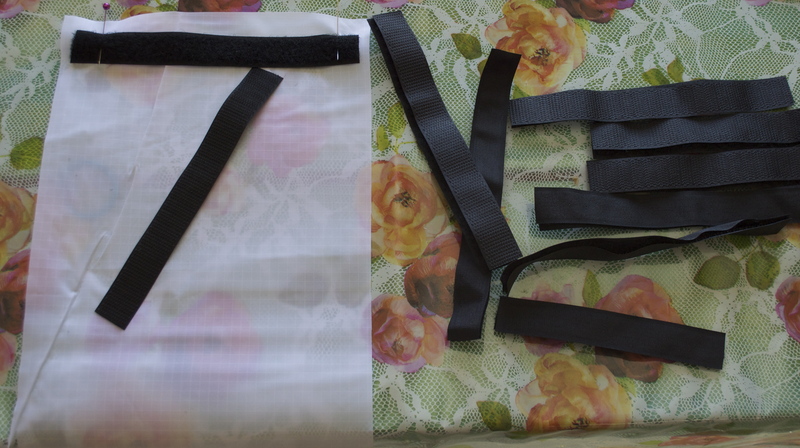 Next, cut your velcro a little smaller than the size of your fabric/lining. Pin the velcro on the lining. Making sure they are even on both sides of the lining, because you want your velcro to line up so it closes correctly. 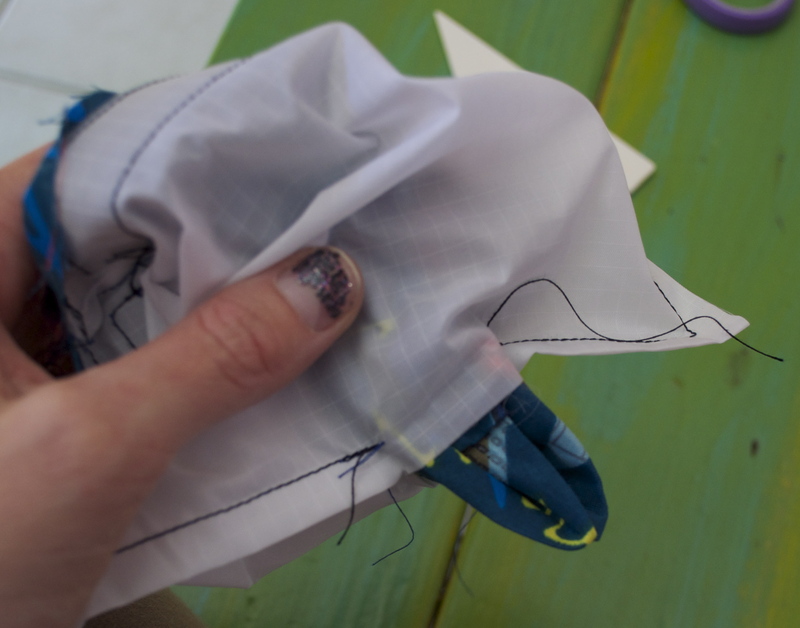 Then sew- all the way around the velcro- back stitch at the start and finish to secure the stitch. 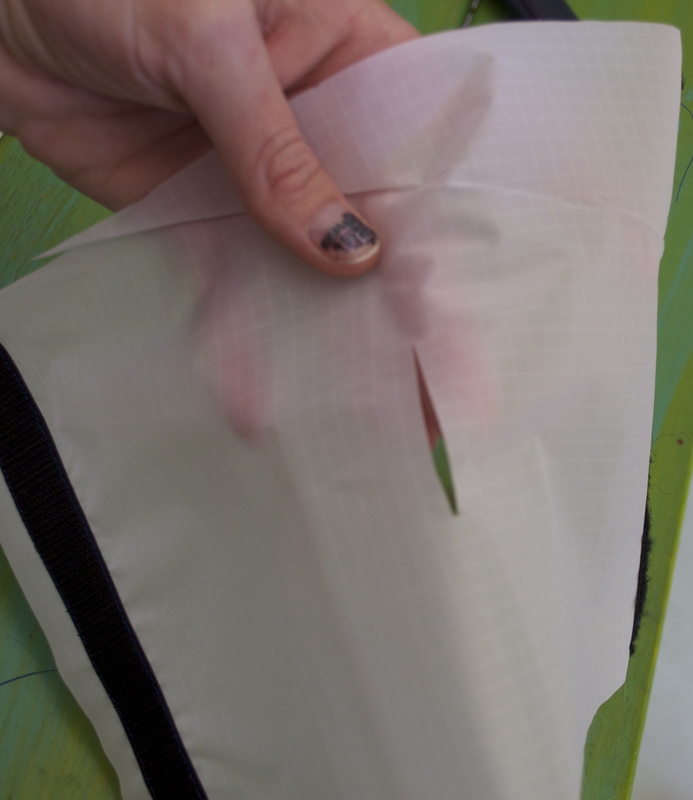 Cut your slit at the bottom of the rectangle about 2 inches- make the slit long enough to pull fabric through when finishing the bag. 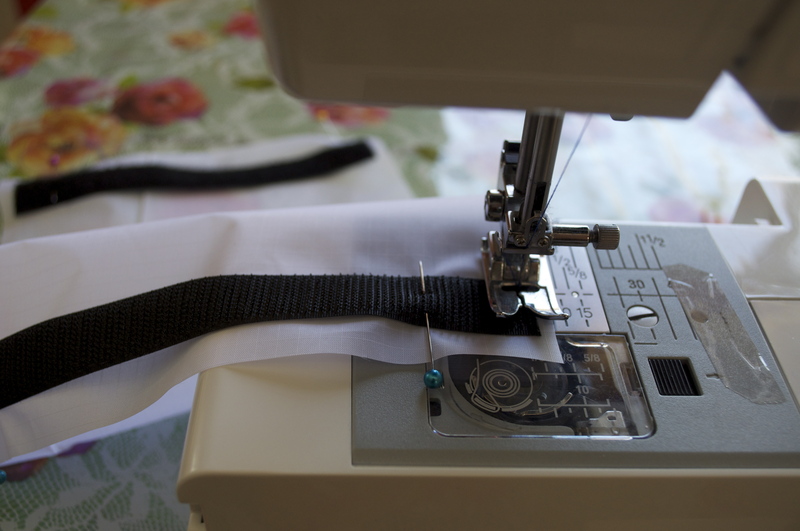 Once, slit is cut, put the velcro together, and sew along the sides and to the beginning of the slit, back stitch at the stop and finish again to secure stitch. 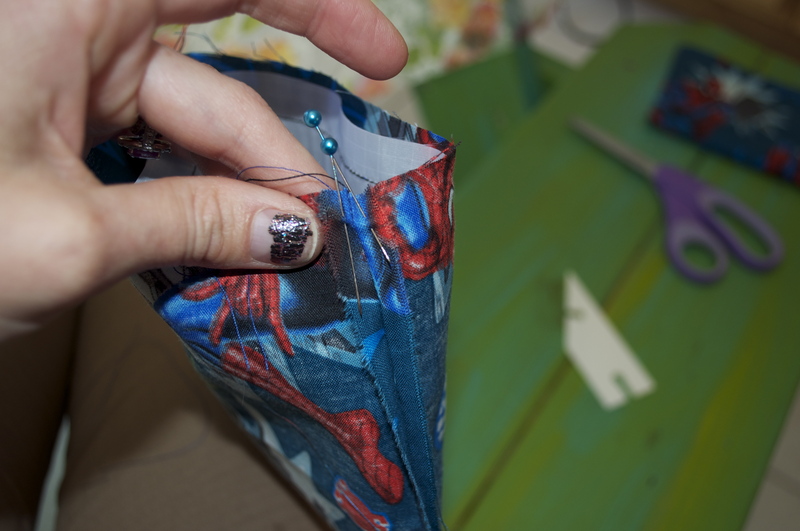 Start sewing again on the other side of the slit to the top of the bag. You will do the same thing with the cotton material. 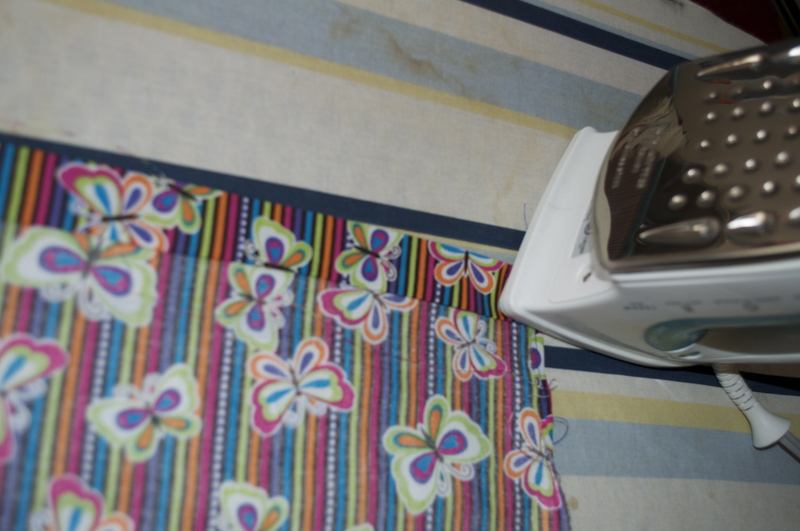 Place right sides together- sew from the top of the bag all the way down the side, across the bottom and then back up- do not sew the top closed. You should now have two squares. Take the lining and turn it right side out. Use your awl and use that to make the corners nice and pointy. Place the lining into the bag. 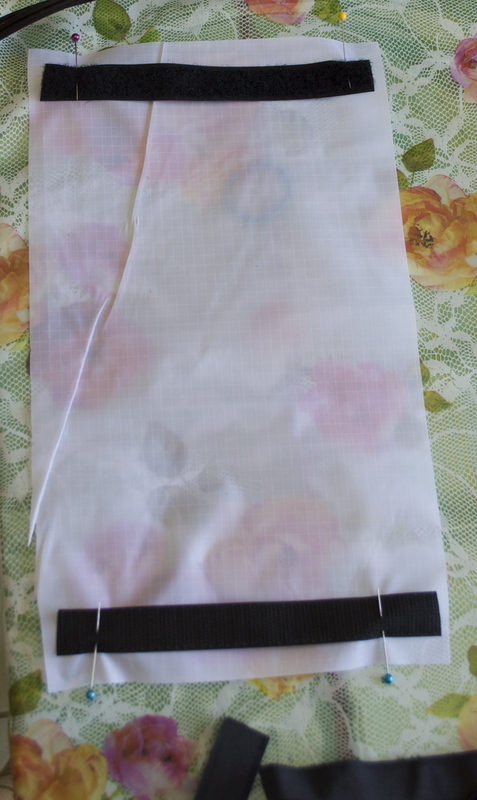 Right side of lining to right side of bag. The bag should be something like this- the outside of the bag should be showing. 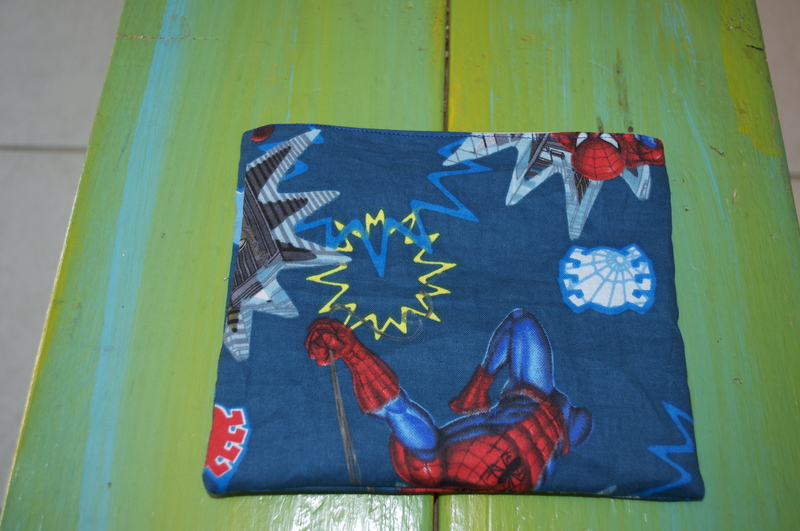 Next, pull your cotton fabric through the hole you made in the lining earlier. The bigger the hole, the easier it is. 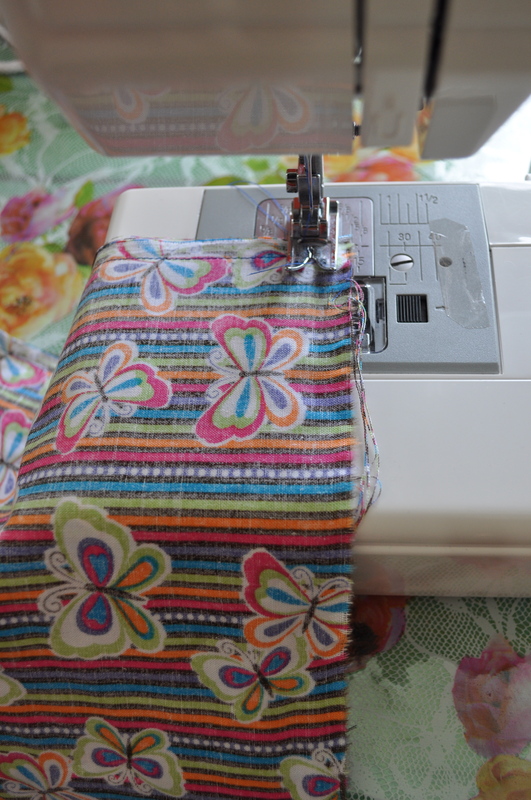 You are going to sew all the way across in a few steps- so make it bigger. The one in this pic was too small- not too small to pull fabric through, but I ended up making the slits A LOT bigger after this first one. Use the awl to make the corners look nice and pointy. 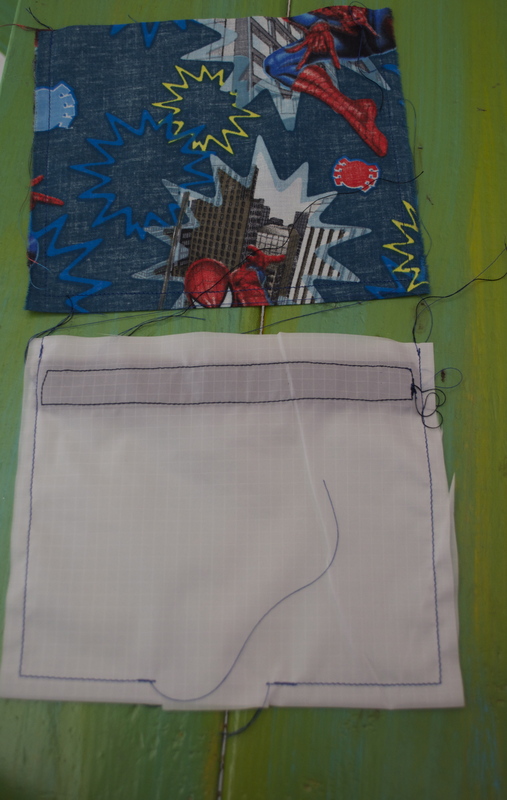 Time to finish the bottom of the lining. 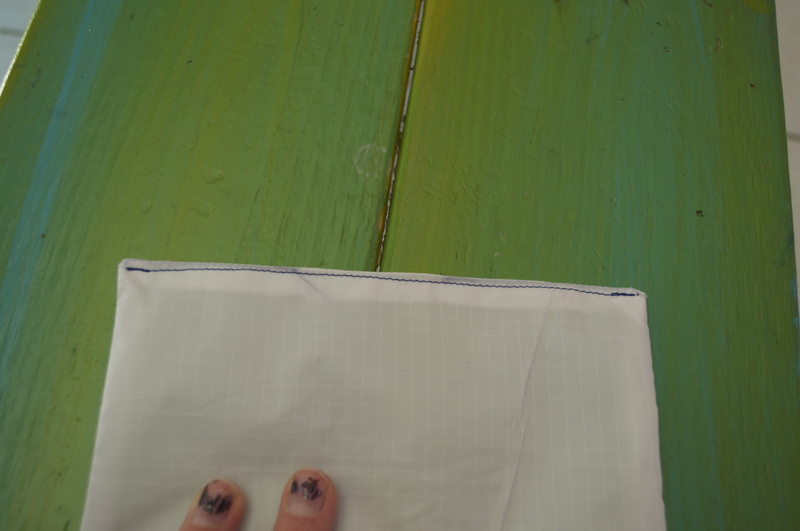 Turn under the open slit and sew across the bottom of the lining. 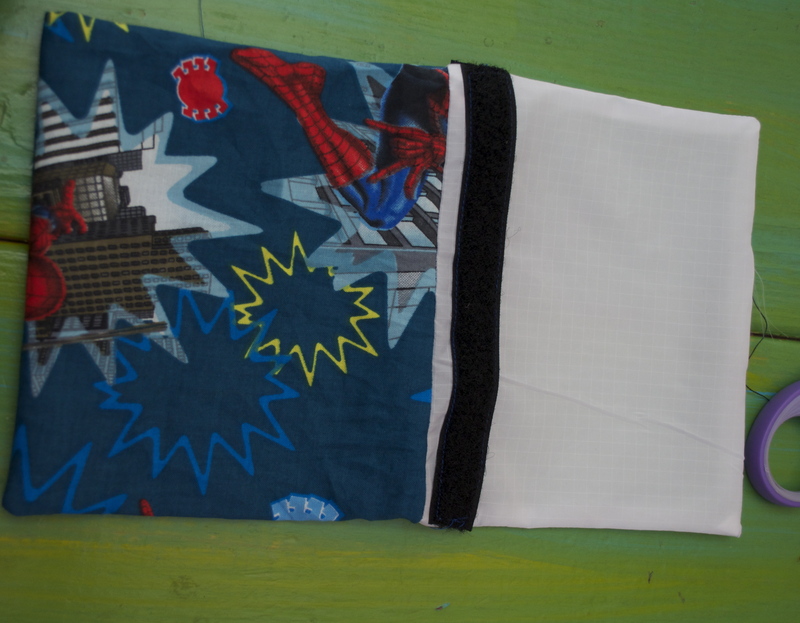 Make it about 1/8″ seam. 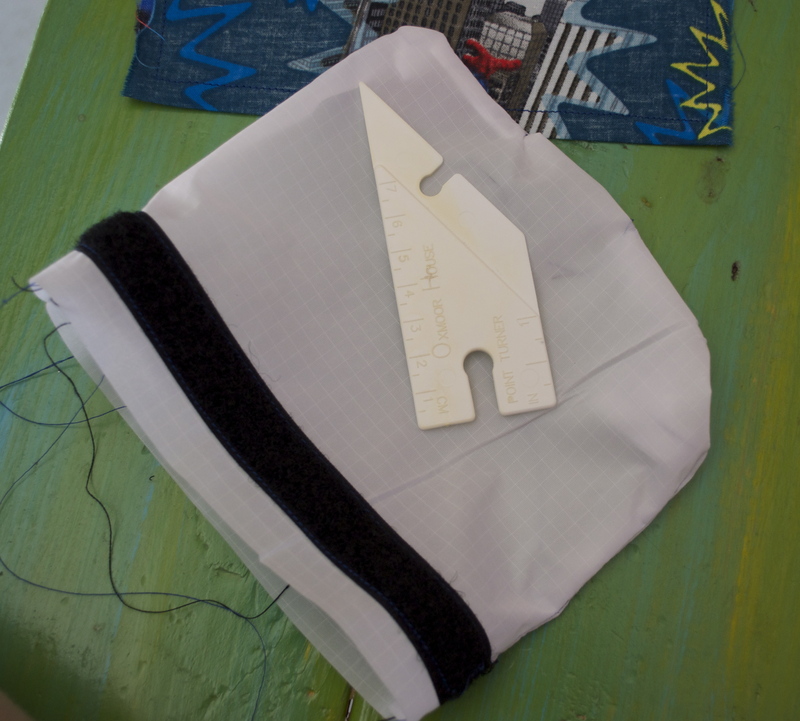 Then put the lining inside the bag- get the lining all the way inside the bag- next we will top stitch the bag to give it a nice finished look! 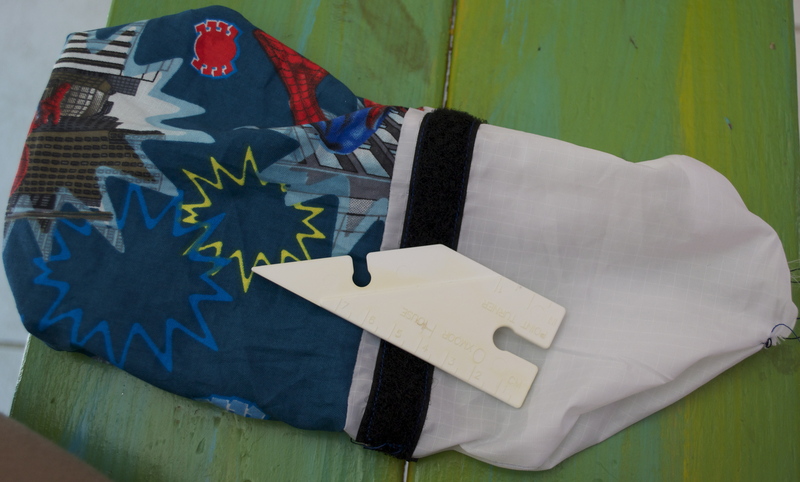 Posted in DIY, green, sewing, tutorial and tagged cotton, cute, DIY, easy, green, reusable, sandwich bags, sewing, snack bags, tutorial, velcro. Bookmark the permalink.